Originating in England during the 18th century, the Bedlington Terrier was used by gypsies as a vermin hunter and small game retriever. 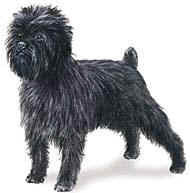 They are often affectionately referred to as the "gypsy dog". 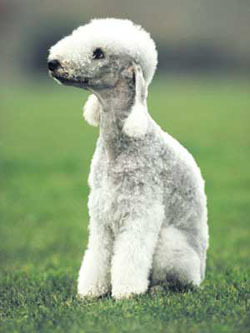 The Bedlington Terrier is often described as a dog with the heart of a lion and the head of a lamb due to their unique appearance and assertive demeanor. 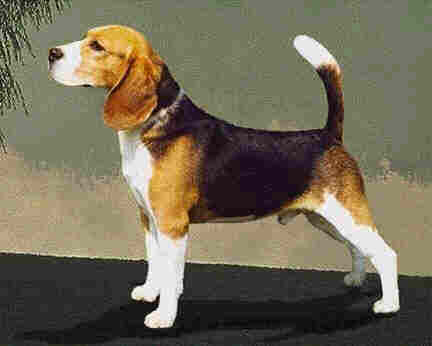 A graceful, lithe, well-balanced dog with no sign of coarseness, weakness or shelliness. In repose the expression is mild and gentle, not shy or nervous. Aroused, the dog is particularly alert and full of immense energy and courage. Noteworthy for endurance, Bedlingtons also gallop at great speed, as their body outline clearly shows. 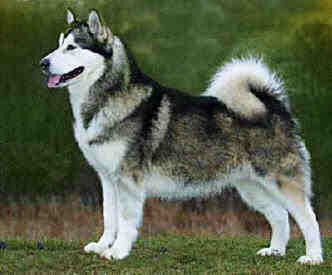 Originally bred as a hunting and fighting dog, this breed has been known by a number of other names. 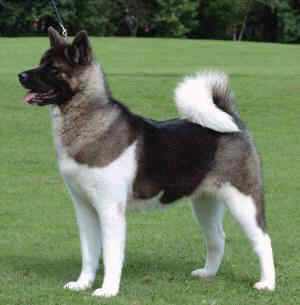 The breed was registered with the AKC in 1886. The Bedlington Terrier has been described as a dog with the heart of a lion and the appearance of a lamb. 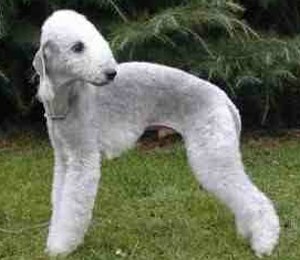 With his pear-shaped head, arched back and curly coat, the Bedlington Terrier in fact does look like a little sheep. The head has no stop, descending in an unbroken line from crown to nose. The eyes are small and deep set. It has a pointed tail and straight front legs with hare-like feet. Bedlington Terriers are medium-sized dogs covered in lightly-colored fur, sometimes patched in two colors. Bedlington Terriers bear a passing resemblance to Whippets in their shape, and their curling, dense coat gives them a fairly non-threatening look, something like a tiny cloud with two eyes, claws, and a panting pink tongue. The Bedlington Terrier has a light, curling coat, usually about one inch in length. The coat should be resistant to touch, but not wiry. Calmer and less boisterous than many other terriers, the Bedlington Terrier is known as a dog with a good nature and mild manners. This is an agile and energetic dog, which carries itself with grace and style. These dogs also love to explore and have a curious streak. The Bedlington Terrier is an intelligent dog, and is affectionate and alerts, which makes him a good watchdog. The Bedlington Terrier will get on well with older, considerate children and with children that he has been raised with from an early age. Depending on the individual dog's personality, the attitude of the Bedlington Terrier around strangers can vary from curious to timid or reserved. 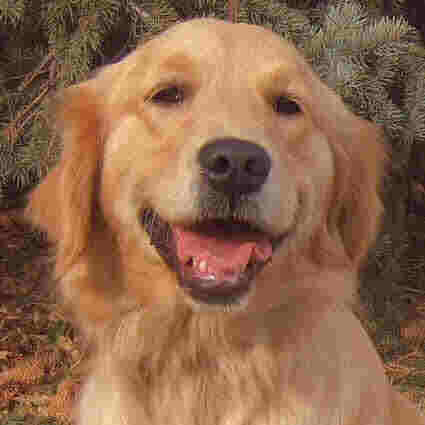 These dogs tend to get on quite well with other pets, although they may give chase to smaller animals that make a run for it. These dogs can have quite a stubborn streak that can sometimes make training difficult, and they area also barkers and diggers. 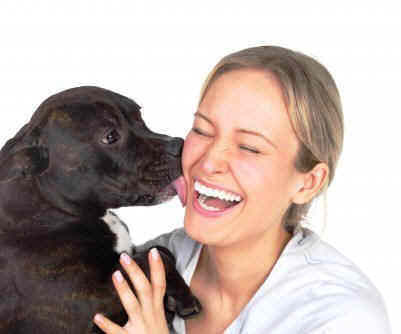 This breed is best suited to more experienced dog owners. Despite the complicated, tangled appearance of the Bedlington Terrier's coat, grooming the Bedlington is surprisingly simple. The curly coat of the Bedlington Terrier will need to be brushed and combed on a weekly basis, and every couple of months should be trimmed to stop it from getting too shaggy or out of control. You should make sure that you also check and clean the dog's ears on a regular basis to reduce the chances of ear infections. The Bedlington Terrier is not a shedder and this makes the breed well suited for allergy sufferers. The Bedlington's specialized grooming involves clipping the body and head fur fairly closely to the dog's skin in order to accentuate its distinctive shape, while leaving the fur on the legs slightly longer. 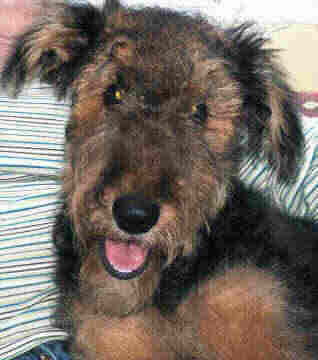 Above all, the hair in the ears should be clipped closely or even shaved, as the Bedlington's curly, dense fur can easily breed moderate infections. Although washing the Bedlington may seem to be a good option from time to time, it's not a good idea to bathe this breed too frequently-their fur can become looser and less attractive. The Bedlington Terrier has a lifespan of around 12-16 years. The Bedlington Terrier is prone to a serious inherited liver problem known as Copper Storage Disease. They also have a tendency for such health issues as thyroid problems, cataracts, and kidney disease. Bedlingtons, like many terriers, are fairly self-sufficient as far as exercise goes. For apartment living, one or two walks a day will give your dog the outdoor exercise he or she needs. It's necessary to walk your Bedlington on a leash. Bedlington Terriers are quite nervous, and will think nothing of breaking away to chase a squirrel, rabbit, cat, or even another dog-sometimes a much larger and more dangerous dog. If you don't fancy chasing your Bedlington and breaking of fights, keep them close at hand. If you plan to keep your Bedlington in the yard when you're not around, make sure that you've done some work toward eliminating digging as a problem behavior. Bedlingtons are notorious for their digging abilities, and any untrained Bedlington left in a yard for a sufficient amount of time will no doubt start tunneling. It's best to keep a close eye on your Bedlington Terrier and not to allow him or her to be in the yard alone until you're reasonably sure that he or she knows for sure that digging is not appreciated.